Esmeralda is once again in red, does anyone else think this a cliche that should die? Because I’m getting annoyed by it, (future article*). But other than that I like the artwork it’s fairly simple yet effective. Today’s Fan-Art was created by MimiStriped. 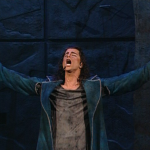 It’s base on a scene from the book where Frollo shows Esmeralda his wounds he gave himself in reaction to her being tortured. This scene is during his confession to her in Jail and it’s my favorite scene from the book. 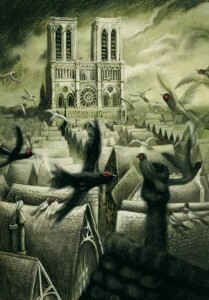 And this is a lovely rendering. In all seriousness Disney’s Hunchback of Notre Dame really only has the basic premise of the original novel . All the characters differ in attitudes and backstorys. The way the story unfolds and comes to its conclusion is different because of the characters. In making Frollo a judge and not a priest we loss his turmoil which makes Frollo an interesting and complex character. 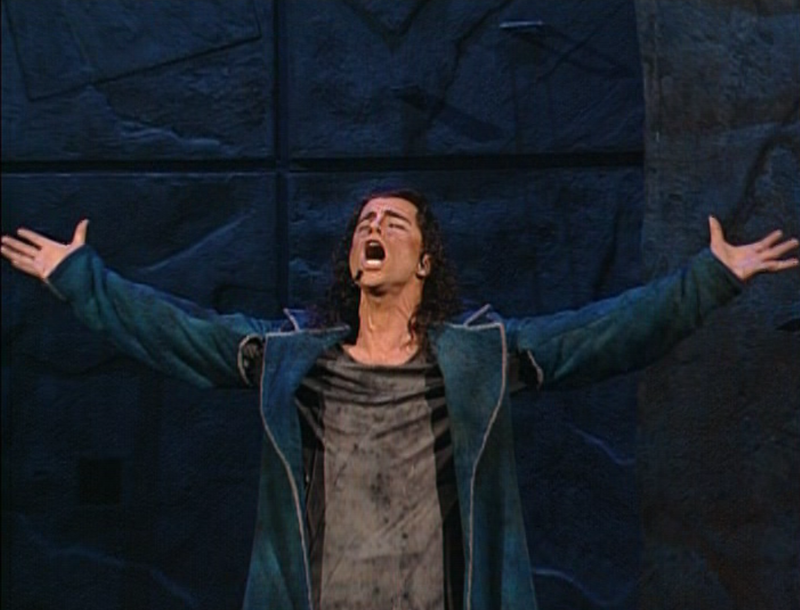 I really don’t care as much about his lust and obsession for Esmeralda just because he hate Gypsies. Also in the book, his obsession occurs slowly. 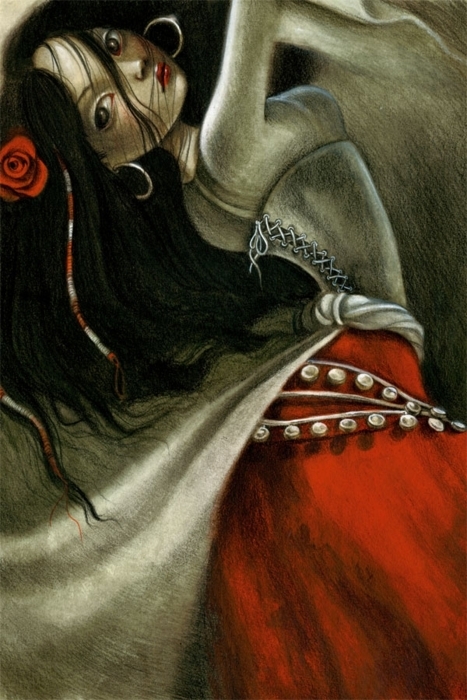 He sees her and is instantly taken by her youthful beauty. After that he begins stalking her and by kidnapping her he forces the the plot to take action. 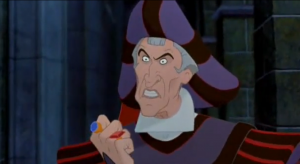 In the Disney movie, Quasimodo doesn’t have the some loyalty and Frollo abuses him by telling him he’s a monster and keeps him locked in the tower. 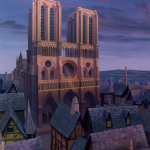 In the book Frollo did no such thing and Quasimodo could leave Notre Dame if he wished. 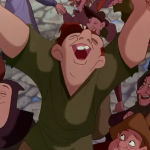 Quasimodo in the Disney movie is very much like Ariel. He wants to live with the normal people. 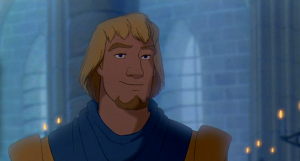 He is very naive, kind and gentle. 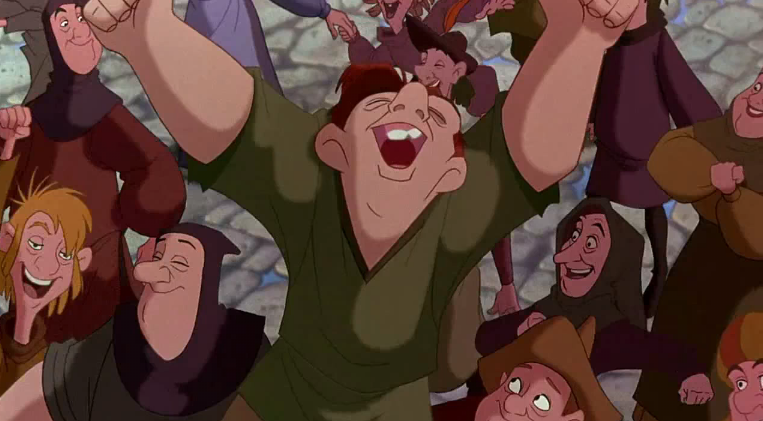 In the book, Quasimodo is kind and loyal to those who have been kind to him i.e Frollo and Esmeralda. However, Quasimodo is also angry and doesn’t really like people. 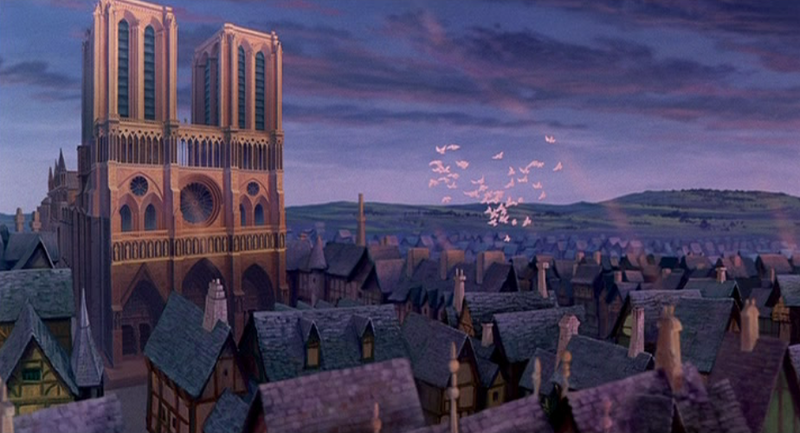 He would never want to leave Notre Dame as Notre Dame is his universe. He loves Notre Dame so much that he is very much a part of it and his lovers are bells. 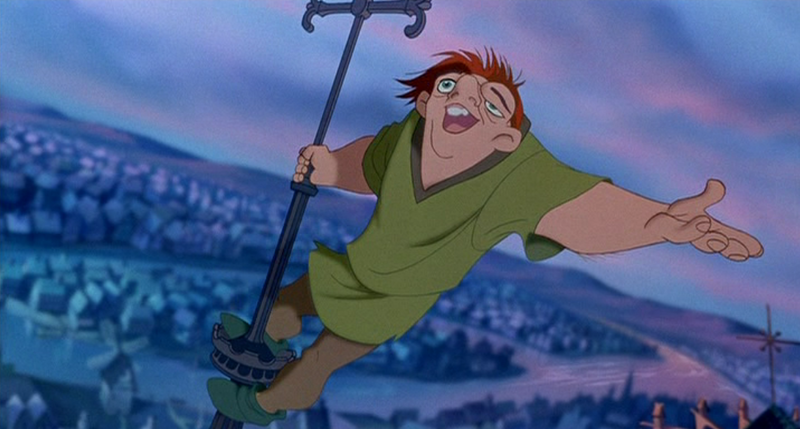 The relationship between Quasimodo and Notre Dame is destroyed in the Disney version as Notre Dame is not so much a sanctuary but a prison. 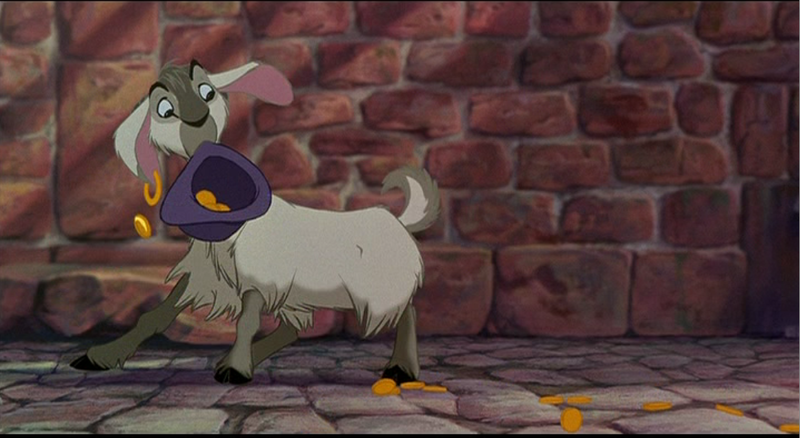 Also in the movie Disney he briefly mentions the bell but you don’t get the sense that he loves the bells. 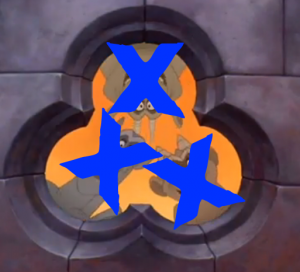 I also don’t see this Quasimodo killing Frollo in fit of rage or lying down next to Esmeralda to die. 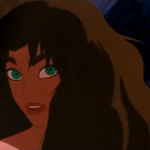 Esmeralda is the polar opposition between Disney movie and the book. 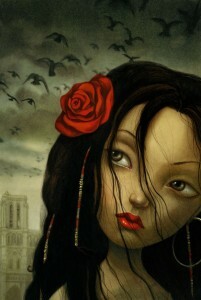 In the book she is at least part French and is young, beautiful, naive, shallow, childish and kind of dumb. 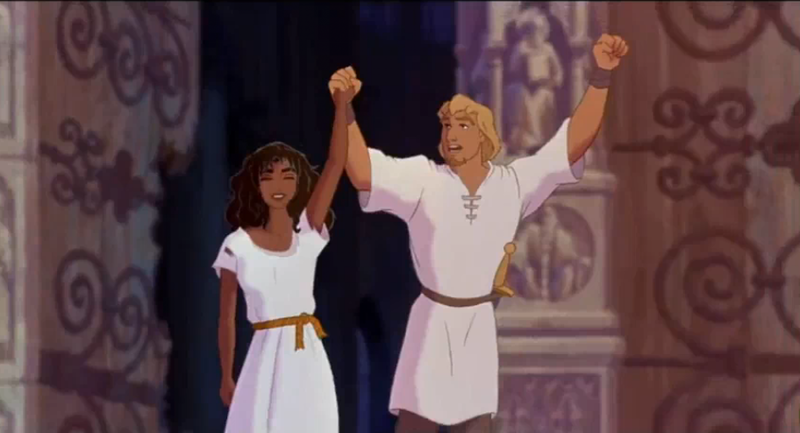 In the Disney movie, while she is beautiful, she has none of the other traits, though the youth is debatable. She is confident and is in control of her sexual appeal. 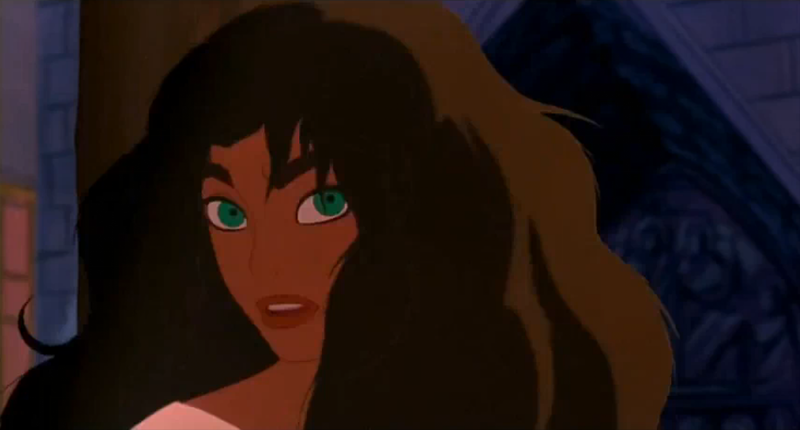 In the Disney version she is a full Gypsy and we are never given any sense of her backstory. 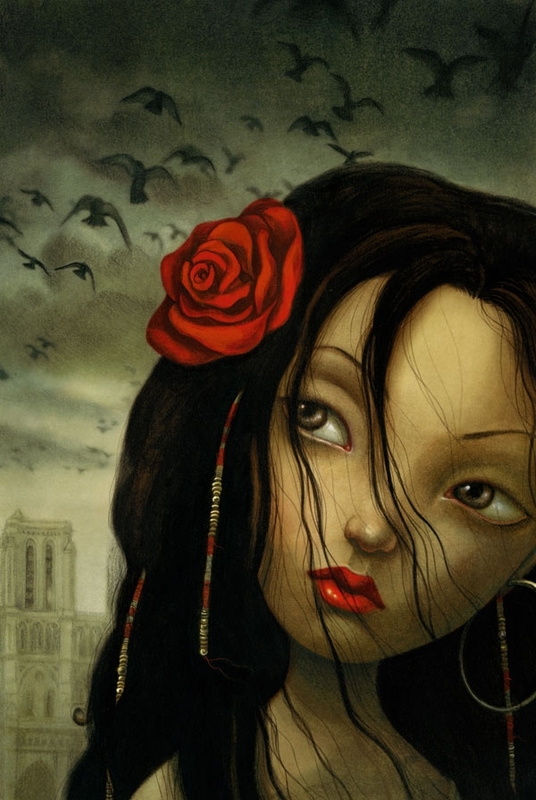 In the book she was unaware of her beauty and she lacks any worldliness. This naivety is what gets her into trouble in the book and ultimately is what kills her and not a passion for social justice. 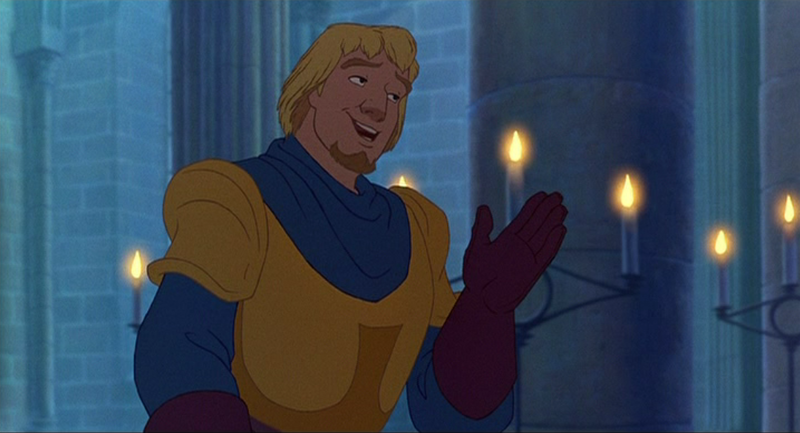 Phoebus in the book is a jerk who is kind of dumb and just wants to sleep with pretty girls. 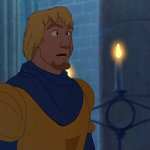 Also he is two-timing cheat, who despite being engaged he tries sleeps with every good-looking girl he can. 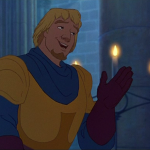 In the Disney version is he is noble, moral and likes to crack bad jokes. 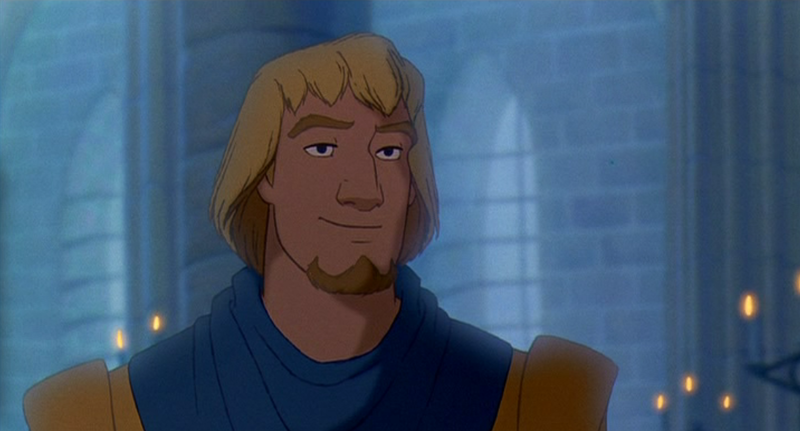 Not like book Phoebus at all. 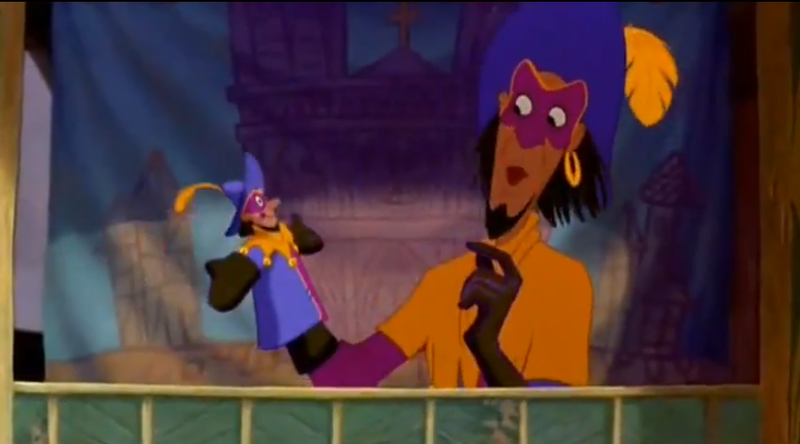 Clopin in the book in the leader of the Court of Miracles, not the Gypsies. 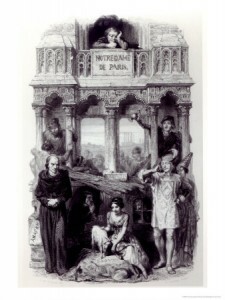 The Leader of the Gypsy in the book was the Duke of Egypt. 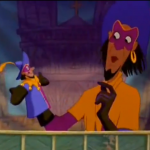 Typically, the leader of the Court of Miracles and the Leader of the Gypsy get fused into one which is Clopin. That’s a minor issue. 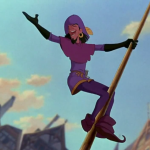 Compared to Frollo, Quasimodo, Esmeralda and Phoebus; Disney Clopin’s differences are not so bad. 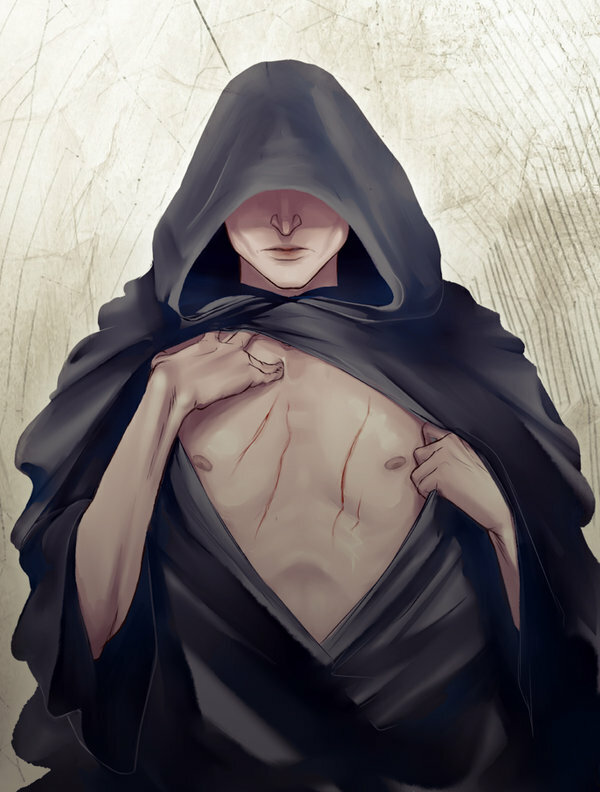 He tells stories like Gringoiore (a character in book) and is the leader of the Court of Miracles; he’s two characters in one, or three. Djali in the Disney movie is a pretty minor character who doesn’t do anything other than add some charm and humor. 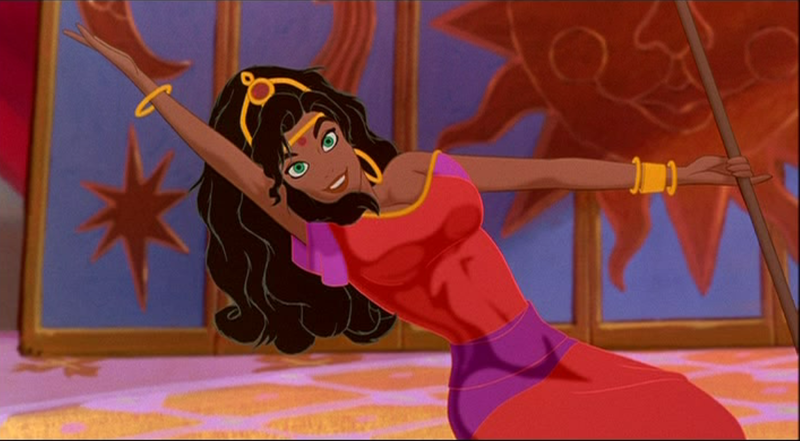 In the book however Djali is pretty essential to the plot. 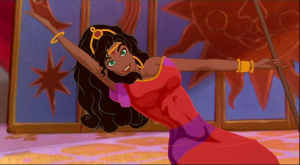 Djali is the prime evidence for why Esmeralda is convicted of being a witch. 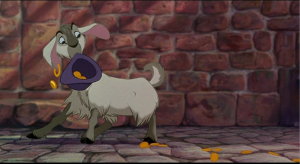 Goats were considered to be representational of the devil and the tricks innocence tricks Djali performed like spelling and telling the time were thought to be the work of witchcraft by the judges in the book. 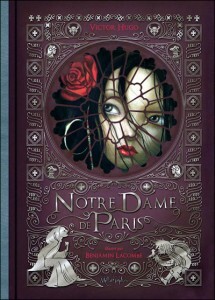 Of course, since the plot veers so far the book it doesn’t really matter. 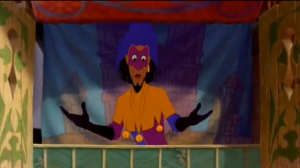 Djali’s main function in the movie is a cute sidekick who sells toys to children . 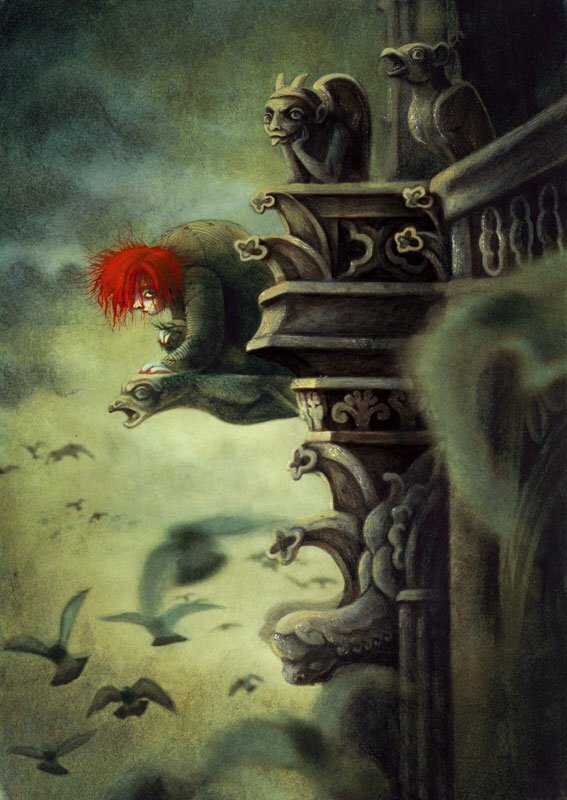 The Gargoyles do not count, they’re not in the book. 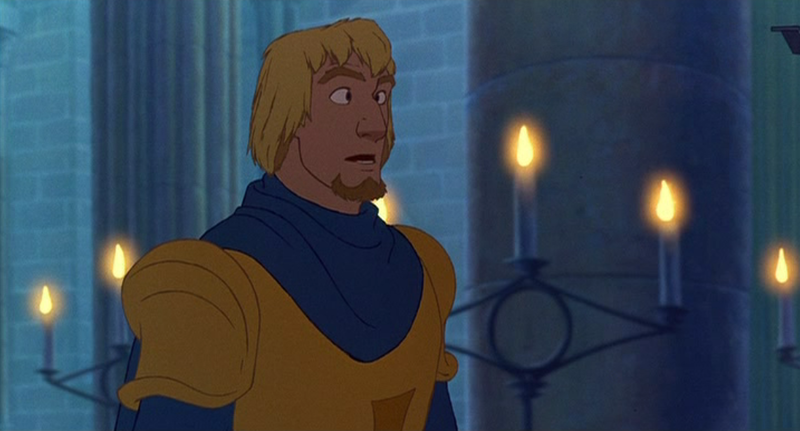 It really does seems like someone early in production took the cliff notes of Hugo’s book, throw them into a blender, strained, added water and poured out the Disney Plot. Then that got re-written by those people who didn’t read. And the differences in the characters in proof that. 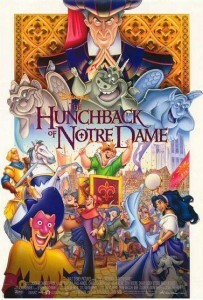 Where do you begin to discuss the differences between Disney’s Hunchback of Notre Dame and Victor Hugo’s original novel Notre Dame de Paris? I guess it easier to discuss the similarities. 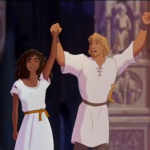 They both take place in Paris, there is a hunchback who is the bell ringer of Notre Dame and a pretty gypsy girl and the main characters are attractive to her. 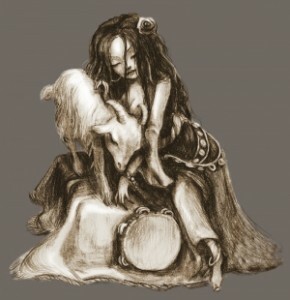 She has a goat and is dancers. 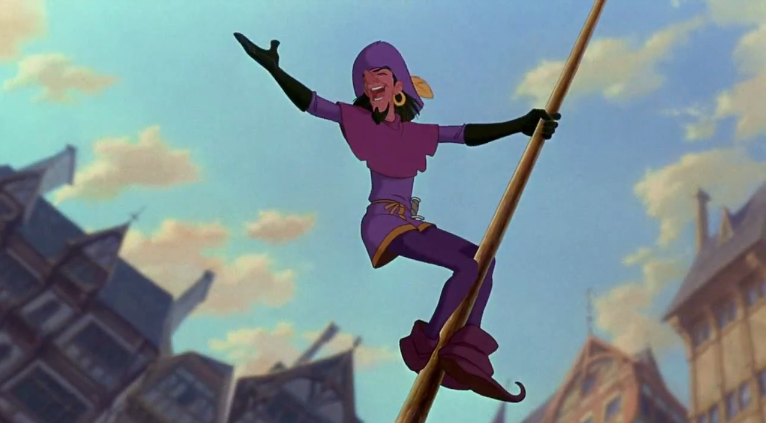 There names are the same (Quasimodo, Claude Frollo, Esmeralda, Djali, Phoebus, and Clopin) and that’s pretty much it. No Seriously next time we’ll go through the major differences.